Deprecated function: The each() function is deprecated. This message will be suppressed on further calls in menu_set_active_trail() (line 2405 of /mnt/stor12-wc2-dfw1/597038/972678/www.cheshireeducationfoundation.org/web/content/includes/menu.inc). If you have a news article that you'd like to suggest for our site, please contact us for more information. The Cheshire Education Foundation is planning its second “Trivia Challenge” fundraiser Saturday night March 16th at the Parks and Recreation Center on South Main St. Last year’s inaugural Cheshire Trivia Challenge helped the foundation raise more than $2,000 to help support programs and scholarships for Cheshire public school students. 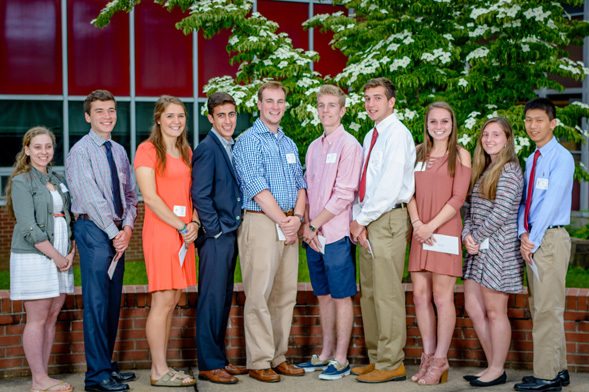 Fifteen graduating seniors from the Cheshire High School class of 2018 will share $32,000 in scholarships administered by the Cheshire Education Foundation. The winners were announced May 15th at the Cheshire High School Awards Convocation. The students and their families will be honored at a reception in June at the Dodd Middle School library. he board of the Cheshire Education Foundation has a new student ambassador from the Cheshire public schools. Ananya Gulati, a junior at Cheshire High School, has started attending the CEF monthly board meetings to help connect the charitable foundation with the student population. Registrations are now open for the Cheshire Trivia Challenge, click here to sign up. The event will take place on Saturday, March 16 at 7pm. So many teams have signed up for the first annual “Cheshire Trivia Challenge,” that the event scheduled for Saturday night March 3rd at the Cheshire Parks and Recreation Center has sold out. Twenty-five teams of four people each will match wits to win prizes, while helping the Cheshire Education Foundation raise money that will fund scholarships and learning enhancements for students in the Cheshire Public Schools. The 2017 CEF scholarship winners pictured are from left, Hayley Bobok, Spencer Kinyon, Colleen Carroll, Mateen Karimi, Benjamin Rand, Ryan Novia, Brendan Hogan, Kaitlyn D'Andrea, Christina Middendorf, and Roger Chen. For the first time in its 22-year history, the Cheshire Education Foundation has a student ambassador from the Cheshire Public Schools. Shivani Padhi, a junior at Cheshire High School, attended her first CEF meeting last week. The Cheshire Education Foundation will provide $20,000 in 2017 to fund a variety of student development and learning opportunities that would not be possible through conventional funding. The CEF board is encouraging teachers in the Cheshire Public Schools to apply for new “mini-grants” through the office of Superintendent Jeff Solan.